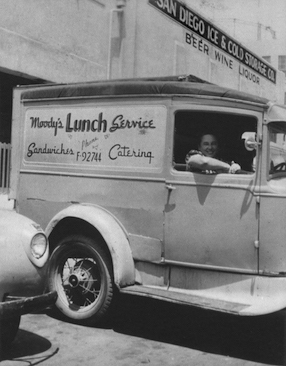 In the 1920s mobile catering was unheard of, but in 1926 Grandma Moody saw the need for good, homemade sandwiches available on the streets of San Diego, so they loaded up the car with cold sandwiches, took to the streets, and never looked back. Throughout the 1920s, 1930s, and World War II, business grew slowly. The Moodys were selling just enough sandwiches to stay in business. They used innovative, homemade inventions to make sandwich production quicker and easier, but the meat was still sliced one slice at a time. Each day they assembled boxed lunches that included two sandwiches, a piece of pie, and a salad, loaded the car, and sold them on street corners for $0.25 each. It wasn’t until the nation-wide economic prosperity of post WWII America that the business began to truly take shape. 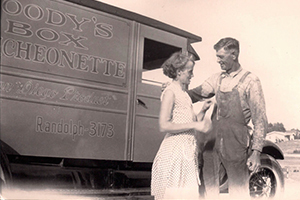 After returning from war, Dennis Moody bought his first panel truck, a car specially outfitted with sandwich storage, and partnered with his brothers Cecil and Bill. They began work in earnest and bought their first shop. Sandwiches were prepared daily in the shop and then delivered in the panel trucks to construction workers and people on street corners. With the advent of the “cold truck,” a truck equipped with both hot and cold storage to keep drinks colder and sandwiches fresher, the business expanded. They expanded to their second facility, and then to their third, our current location. Times were good and people were hungry, and what had started as a homemade sandwich operation had become a fully fledged mobile catering company. In the 1980s the “hot truck” was introduced to San Diego and remains the mobile catering vehicle of choice. Much more advanced than a cold truck, the hot truck has a complete onboard kitchen capable of cooking up hot food in any location. In 1985 Moody’s completely converted from cold trucks to hot trucks. 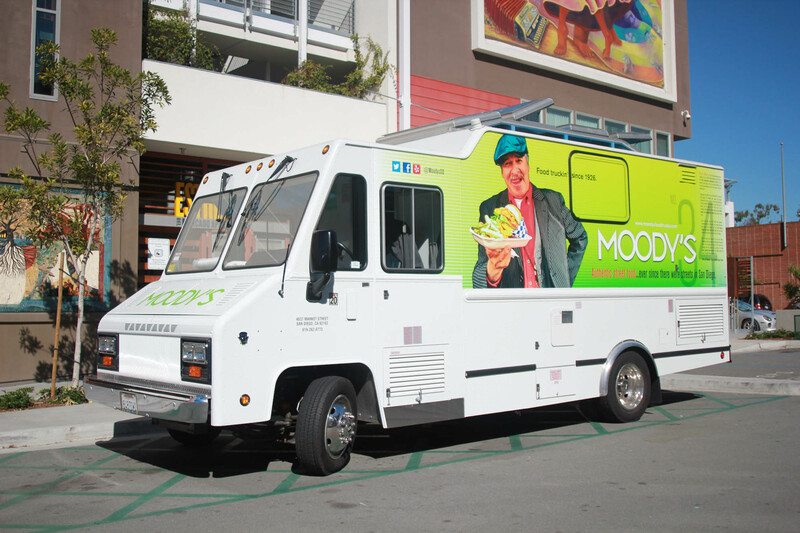 Since then, Moody’s Lunch Service has continued to be the largest and finest mobile catering service in San Diego, always striving to conveniently bring the joy of fresh food to the streets of San Diego. 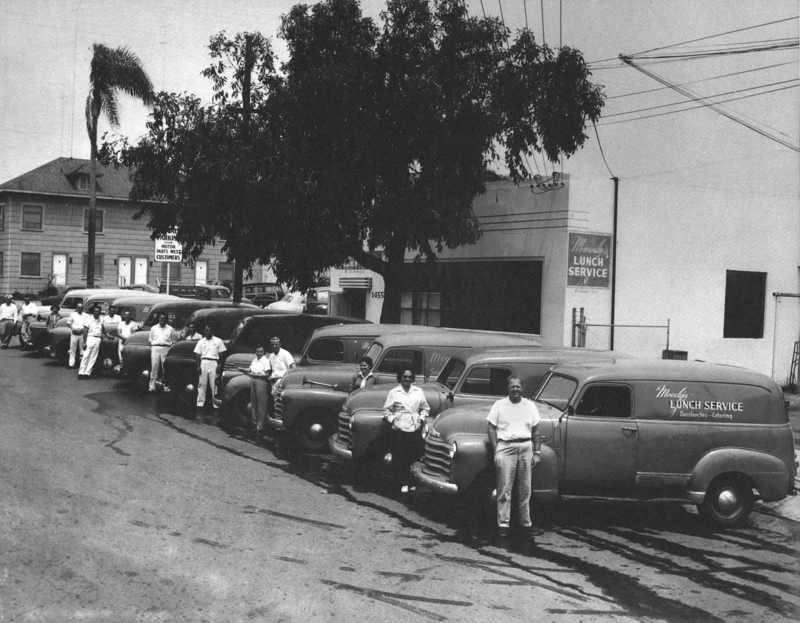 After 90 years in the making, Moody’s is still a family run business, dedicated to serving fresh and quality food to the people of San Diego. In that way, nothing has changed since 1926. However, in other ways, we have changed. With our modern fleet of catering trucks we are able to serve more locations, covering a larger area of San Diego, bringing quality food to your workplace, no matter where you are.